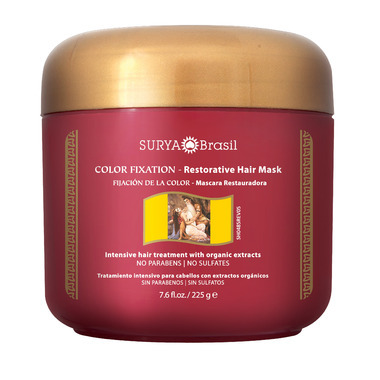 Surya Color Fixation Restorative Hair Mask moisturizes and restores color-treated hair, imparting radiant shine, smoothness and vitality. It protects and locks in color longer, restoring the hair’s natural beauty. Does Not Contain: Parabens, mineral oil, synthetic colors and synthetic fragrances. How to Use: After washing the hair, apply the Restorative Mask, strand by strand, from roots to ends, and massage softly. Let it act on the hair for 15 minutes. Afterwards, rinse with plenty of water. Ingredients: Deionized Water, Cetearyl Alcohol, Behentrimonium Methosulfate, Cetrimonium Chloride, Tocopheryl Acetate, Orbignya Oleifera (Babaçu) Seed Oil, Mauritia Flexuosa (Buriti) Fruit Oil, Theobroma Grandiflorum (Cupuaçu) Seed Butter, Sorbitol, Hydroxyethylcellulose, Citric Acid, Essential Oils (Rose Flower Oil, Cananga Odorata Flower Oil, Jasminum Officinale (Jasmine) Oil and Santalum Album (Sandalwood) Oil), Lawsonia Inermis (Henna) Leaf Extract, Arnica Montana Extract, Phyllanthus Emblica (Amla) Fruit Extract, Paullinia Cupana (Guarana) Fruit Extract, Achillea Millefolium Extract, Genipa Americana Extract, Malva Sylvestris (Mallow) Extract, Corylus Rostrata (Hazel) Seed Extract, Daucus Carota Sativa (Carrot) Root Extract, Euterpe Oleracea (Açaí) Fruit Extract, Zizyphus Joaseiro Bark Extract, Aloe Barbadensis Leaf Extract, Malpighia Punicifolia Fruit Extract, Bertholletia Excelsa (Brazil Nut) Extract, Chamomilla Recutita (Matricaria) Extract, Hydrolized Rice Protein, Phenoxyethanol. I love henna however it sometimes dries your hair out even when you carefully add your favourite hair oil to it before colouring. This hair mask saves it! Soft and silky locks with a nice smell. Will buy again. Used this mask after applying the Surya Brasil henna cream. Great smell, hair is so silky soft after the recommended 15 minute application. Love it! this is the first time I purchased this product. I tried it after my hair colour as treatment. it works.